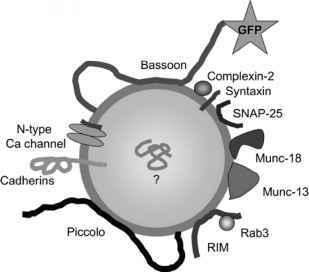 separate synaptic domains from nonsynaptic cytoplasm. This region is frequently termed the "periactive zone." The postsynaptic site is defined by its juxtaposition against the electron-dense presynaptic site. Clustered neurotransmitter receptors at the postsynaptic site detect and then transduce the neuronal signal. Synapse formation therefore involves the recruitment of a specific ensemble of molecules at the active zone, periactive zone, vesicle pool, and postsynaptic site. Once mature, the synapse can be maintained for the life of the organism, and in some cases is capable of remodeling in response to input. A number of synaptic genes involved in synapse formation have been identified and characterized at the invertebrate NMJ. The NMJs in C. elegans and Drosophila provide a well-defined genetic framework in which synaptogenesis can be studied in vivo at single-cell and single-synapse resolution.